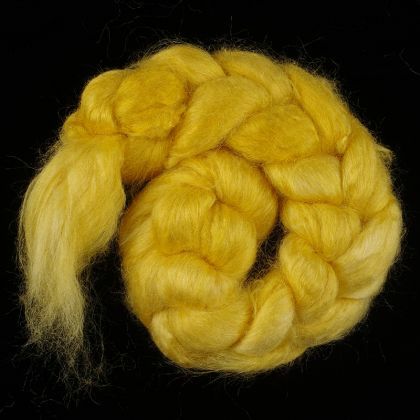 25 Gram (.9oz) - Color: Limited Edition "Golden Aspen"
Our hand-dyed colors are wonderfully tonal, giving rich and varying depth of shade throughout the silk roving. If you've ever seen Aspen trees in the autumn--that gorgeous clear gold is what inspired this golden sunshine color. The silk fibers in our A1 Quality Tussah Silk roving are in a parallel arrangement. The staple length is about 6 inches. Save! Buy any TWO 25g hand-dyed tonal colors and get the THIRD package at HALF PRICE! The discount will be applied manually by a human (you won't see it in your shopping cart) before you silk is mailed and your "pending" credit card charge is made final.